The second I read this comment, I knew that we had the makings of a relevant blog post. After-all, for most of us, isn’t that one of our biggest decorating fears? I’m going to spend thousands of dollars for something I think is pretty terrific now. But in ten years when we go to sell the house and every realtor we speak to cringes, I am going to kick myself for thinking it was a good idea to do a warm color scheme when EVERYONE else is doing gray and blue. When someone mentions a warm color scheme in decorating with beige and rust, the first thing that I think of is that horrid so-called “Tuscan” Style so prevalent in the 90s. Raise your hands. How many of you did a whole number, including the curly-cue wrought iron light fixtures and tumbled marble? You can see a couple of kitchens here to see some of what I’m talking about. And along with that, gobs and gobs of richly saturated cherry wood, heavy chenille upholstery and heavy velvet drapes with sheers. Okay, I’m putting my head on the chopping block, but it’s because I feel that strongly about this one. I’m really not into this look. (understatement) However, you might be and the reason I say that is they still make this stuff and somebody’s buying it. And that is fine if you well and truly like it. But for the rest of us, I need to discuss the problem with this furniture. First of all, please know that the first images that I’m going to share are not from anyone’s home. Nosireee… I learned a painful lesson one day nearly two years ago when I posted a pic belonging to a colleague. ugh. Yeah I was mortified, to say the least, when I found out and took the image down immediately. These first few images are from furniture companies. No names, except for the first one, because the image is watermarked on it. Yes, I know. Very nasty. But I feel visually assaulted when I see this stuff. True. I don’t have to look at it. But if we don’t face the beast, then how are we to learn? And please do not pin any of the first images, unless it’s a secret board. Thank you. Everything else is fine to pin. Sorry Mr. Amini. I know that you must be very proud of your work as you should be if you plaster your name all over your images. And I don’t know any way to say this that doesn’t sound mean. But when I look at this, I am wondering if we were both propagated on the same planet? It is NOT traditional. It is NOT contemporary. But here we do have a warm color scheme. And dated is not the word I would use. The word I would use is wrong. And what kills me is that these vignettes seem to follow a formula. The area rug is always the size of a postage stamp; waaaaay too small. And then there’s the eccentricity of only one table lamp. There is always only one lamp. But ya know… That isn’t so bad, because the darker these rooms are, the better. Want to see more? It warmed up to 50 degrees today and I’m feeling a little frisky! Apparently, there’s a performance of the ballet coming. haha! And geeezzz, even in a straight on shot. There’s only ONE lamp. Clever. At least they gave these monstrosities some feet for a quick get-a-way. Very funny Laurel. But don’t you have something more contemporary with a warm color scheme? It was dated the day it came out because it is also just plain wrong. And we’re back to one lamp. It is also not traditional. Calling this room traditional is like saying that Cool Whip is whipped cream. Cool Whip is aerated plastic with some high fructose corn syrup thrown in. And that is how I feel about this room, as well. Okay, Laurel. Thanks. You convinced us… No warm color schemes ever again! And dear Amy, please stop listening to the garbage on TV and listen instead to your heart. Because there is nothing in any way wrong with a warm color scheme. As a matter of fact, many of our top interior designers and architects, embrace with great passion warm shades of cream, rust, gold, beige terracotta and orange. In fact, remember when we talked about THE most classic color? In fact, one of my favorite architects, Gil Schafer who frequently collabs with the wonderful Miles Redd embraces these wonderful warm tones and his rooms are perfection. I’ll forgive the sisal. Please click the link to find out what that’s all about. It is difficult to find proper credits sometimes. I think that this is also Gil’s architectural work, but the interior design is usually credited to Horton Design Services. I could not find a website for them. 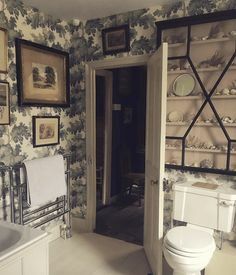 The wallpaper I believe is from De Gournay. Above and below, to shots from a fabulous home which is another collab between Gil and Miles. The color on the wall is an archived color from Farrow and Ball – Orangerie. 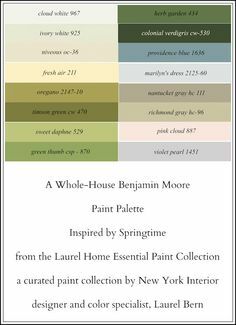 You can find the Benjamin Moore equivalent here. This is from a few years ago and I didn’t realize it until today, was a new house! Miles did the decorating again. Glorious! There are more pics of this amazing place here. Here, the wall color is lightened to a soft marigold. Another good point is that like blue and white crave warmth, warm color schemes crave cool. After Jim left a great comment these colors and my comment, I decided to put this photo in about 12 hours after publishing. What is the beautiful shade of white? Well, if Benjamin Moore, it could be White Dove, Ivory White or even Linen White. like a warm hug. And OH, that floor!!! Oh, while I was combing through every image in Gil Shafer’s portfolio, I came across this image which I’ve had on here before but never knew its origin. Well, now I do! I came across this image and it took me a while to find its source. I think that it’s quite handsome and what makes it, is the mirror. That difference in style is what makes for an interesting composition. Plus this vignette is beautifully layered. The flowers in the fuchsia also give an interesting note. But this sectional is from a line designed by Ken Fulk for Pottery Barn! And then I went over to PB and guess what? They don’t have this in their line any longer. However, PB has some other handsome leather pieces in they just happen to be in warm color schemes, so let’s take a look at a couple for some ideas. Turner Roll Arm leather sofa. There’s also a track arm version. Oh, and it’s on sale right now! This is quite a long sofa but it comes in three sizes and there are numerous choices for the leather. It would be fabulous in a large great room. 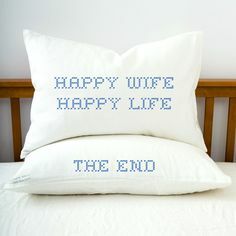 But see how it’s softened with the light pillows and throws? This is another handsome vignette. Love the bookshelves. Actually, I like most of the leather pieces at Pottery Barn. Their upholstery has improved a lot in recent years and it’s most likely because it’s made in the USA now. Another way to use a warm color palette is primarily with whites and creams and then the warm terracotta accents and some blue and green. This one from Williams-Sonoma Home looks perfect for home in the south or a vacation home, perhaps. Of course, there’s more than that. And I made a widget for you of furnishings that I might use in a room with a warm color scheme. And please don’t forget to check out this week’s hot sales! Everything is up-to-date. As much as I love a good grey, all of the painting rich, historic homes that are begging for warmth in the (unfortunately, bad) greys has been making me sad lately. Keep preaching 🙂 Timelessness transcends color, for sure. Forgive me if I missed the reference to this in the post, but I was just looking back through older posts and saw Alexa Hampton’s positing that warmer color schemes are typically more mature and cooler tones are for a younger crowd. I found that really interesting, and often fairly accurate! Poorly planned (or not planned at all) rooms done with poor quality furnishings, rooms that lack proportion, badly executed trim, haphazard fenestration, will not look good even when new. I can’t think of better comment than “Thank you from the bottom of my heart for another wonderful, highly enjoyable post”. Yes, I was in Evansville from 1958 when I was a baby to mid 1971. I left after freshman year at Harrison. Another great post. I agree. It is not the color scheme the was wrong about Tuscan, but the details (or, if I may, level of taste). I bought a leather sofa in about 2006/2007 for a small apartment family room. My main decorating desire was a sofa that could stand up to spilled sparkling water, leaky diapers and goldfish crackers. I bought a tight back rolled arm sofa from Room and Board with rust colored chairs to match. Although Room and Board is mostly known for modern, this was clearly an item to appeal to more “traditional” buyers. In truth, I never really loved it in that living room but since both the sofa and the chairs were really durable, and it looked “good” to most people who came to my house, I was cool with it. Fast forward a few years and we moved into a rental house. Since I wasn’t going to buy new furniture for it, I set it up in the living room that has amazing, amazing light and windows. This time I added Gil Shafer’s sisal rug from above (takes a beating too) and navy blue. Now I love it and I get compliments on the room often and I’m sort of pinching myself that I have 10+ year old furniture bought in the Tuscan trend and it actually looks fresh today. Laurel, thank you for this post! As a diehard warm color lover this is incredibly helpful. Two questions, if I may, please. 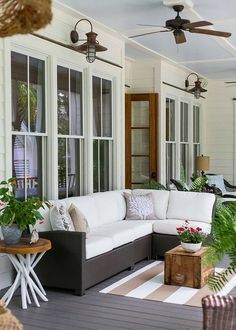 You say warm color schemes can benefit from a shot of cool color, and you also say primarily white and cream color schemes should always have black in them. Perhaps you could show us more examples of that? Also, as a fan of the color red in any form, I’d love to see examples of red and white chinoiserie in rooms. More brown and white would be cool too. With over 500 posts now, it’s getting more and more difficult to remember where things are. But off the top of my head, the master of whites and neutrals is Darryl Carter, so here’s a link to all of his posts. Here’s a link to every time I mention “black.” Of course, it’s a lot of posts! It would be a beautiful world if we didn’t feel pressured to do one thing or another. I believe that the furniture companies are primarily to blame and HGTV. The latter has their pat formulas that we MUST adhere to or else. And the former naturally wants to sell more furniture. Great post! I love warm and hate when I see it maligned online. I personally feel that most looks become dated and think it will be sooner than later that we see all the grey and think it’s dated. I loved this post Laurel. Currently, one of my full renovation clients are all about warm colours and not one thing is gray or blue. Their new paint for their home, along with some furniture they are keeping, all fall into the category of warm. My client calls the colour of her furniture “peanut butter”. While my clients were a little worried to have an entire new home with such warmth (they were worried it was going to be a ‘dated reno’), we are in the finishing stretch with this 3200 sq ft project and it does not look dated at all. Hello Laurel, I’ve sometimes had a sneaking suspicion that those icy-perfect rooms we often see might be more enjoyable to visit than to live in. I do prefer white walls, although the examples you provide show that warmly-colored walls have their charms. In the end, though, I would expect to have to repaint some of these in order to sell, and would build longevity estimates into any decorating plans. I’m not sure about the selling issue. First of all, I can’t tell you how many new clients homes I’ve been in where they just bought a home with the most hideous colors. I’ll never forget one particularly horrid dining room was painted a shiny, but in a plastic way, DARK, DEAD green and the trim was bright white and FLAT. Who the hell paints the walls shiny and the trim flat? I feel that a beautifully decorated, beautifully put together room will trump the so-called sale colors. Not that there’s anything wrong with them. It’s just that I don’t adhere to the IT MUST BE THIS COLOR OR ELSE! But sure. Generally, if the room is saturated like the warm red dining room, the surrounding areas will be quiet. And indeed, there’s another shot which I considered including of the hall looking into the dining room a little, which is equally stunning and the walls are a lovely soft white with columns and all. So, the dining room is like a lovely jewel amongst a sea of pearls! And that warm red is used in other areas of the home. Oh never mind. I just added it in because it makes a great point. Have you written about sisal rugs before? You don’t care for them? What about other natural fiber rugs, like seagrass? Yes! I’ve written about sisal rugs numerous times. I love the way they look. However, spill anything on sisal, including plain old water and it’s going to stain like crazy. In fact, I read somewhere, that somebody spilled water on her sisal, so to correct the stain, she soaked the entire thing! Ummmmm… don’t recommend doing that! You’ll see one post in their twice. Why? A crazy malfunction on a Sunday morning, my busiest time. The images weren’t showing up, which as you can imagine was pretty awful, but I found a work-around until my theme folks could help me with a permanent solution. So, why do you see it so often? Beats me. Maybe they replace it frequently? Seagrass is sublime. I’ve used it dozens of times and it’s great in dining rooms. It’s THE most bullet-proof floor covering out there, except maybe for outdoor carpeting. But you can’t beat the beauty and style of a natural fiber rug! There are lots of posts with antiques but I know that they aren’t always easy to find. And there are usually some antique or well-done vintage reproductions in my hot sales page. But I will certainly consider another post about this. In the meantime, I put antiques in my search box and came up with some posts.